IBM is aiming to make quantum computing more accessible by creating the first commercially-minded universal quantum computer. Though companies could technically buy a quantum computer right now if their hearts so desired, it wouldn’t really be suited to general or commercial use and there’s a good chance they wouldn’t have the space for it. Full-scale Quantum computers are essentially able to handle more complex calculations than digital computers as the quantum bits (qubits) they use work in a more efficient non-binary manner. They’re also physically huge and require an elaborate cooling system to run. The leading commercial quantum system is called D-Wave 2X and it’s used by NASA and Google which gives you an idea of where we are in the commercial trickle down process. Though it can only run a limited range of algorithms, it’s still much faster and more powerful than current supercomputers. Thanks to its size and limitations the D-Wave 2X isn’t exactly a universal system. By making its quantum computing system cloud-based and accessible via the IBM Cloud platform, IBM Q hopes to “expand the application domain” of quantum computing. IBM Q’s aim is that its first system will have around 50 quantum bits. For context, IBM’s current cloud-based quantum computing system (Quantum Experience) that’s open to the public started out at 5 quantum bits before moving up to 20, so 50 qubits is a significant amount of power. 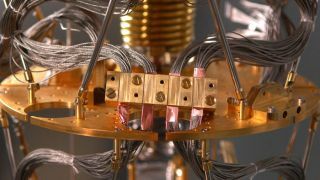 It’s still not at the 500,000 to 1 million qubits requirement for a full-scale quantum computer but it’s laying the foundation for future advancements at the very least. No doubt IBM Q will build on its existing Quantum Experience system, now with a more commercial focus. It would be more powerful than many of the best supercomputers and capable of handling much more complex calculations. The company anticipates that one of the most promising applications for its system will be in chemistry where it says that we could discover new medicines and materials.